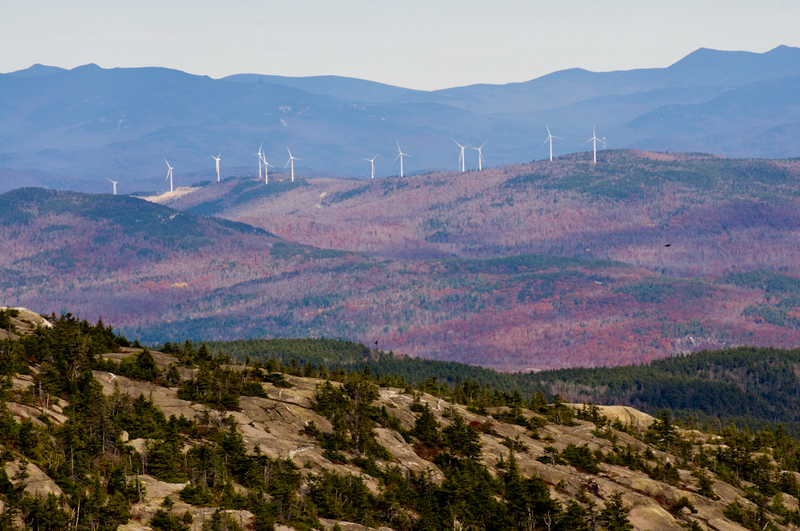 Wednesday was another beautiful fall day in New Hampshire, which made it a perfect time for a short hike to the top of Mount Cardigan. I had just picked up some new Merrill hiking boots and decided Mt. Cardigan was the perfect place to see how they felt. 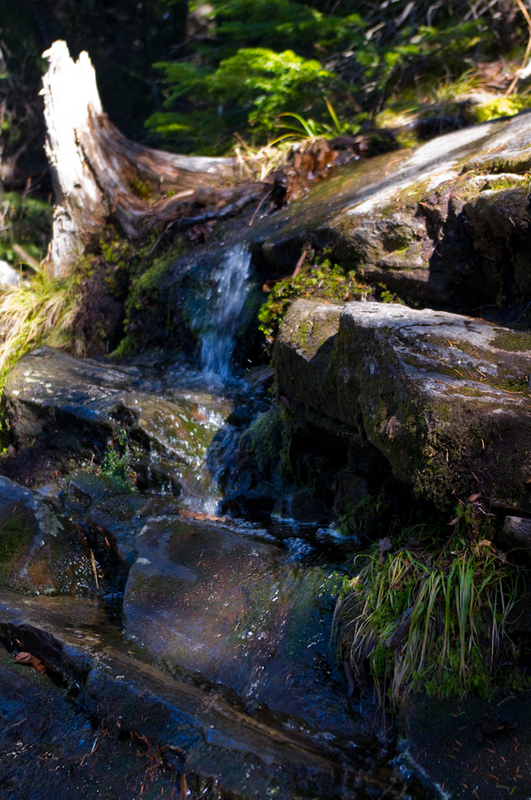 A mountain spring on Cardigan Mountain along the West Ridge Trail. 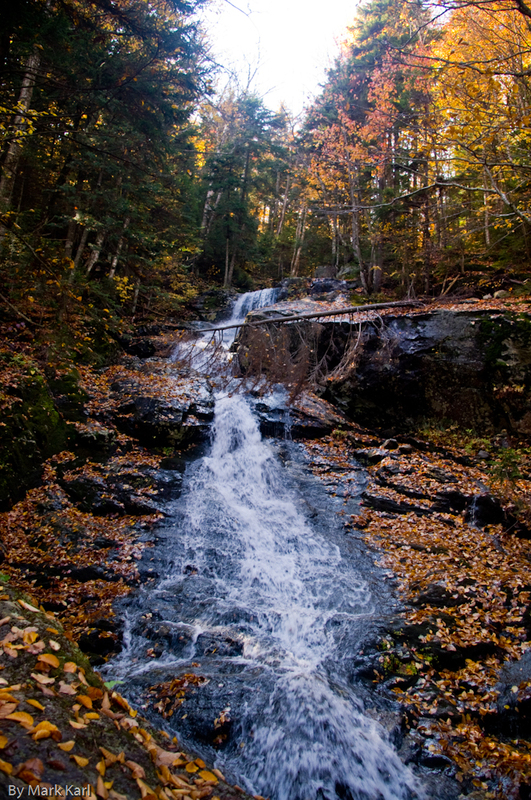 One of the best things about the West Ridge Trail is the waterfalls from a mountain spring near one section of the trail. Grantham mountain with Mt. Ascutney in the distance. Once you get above the tree line there is a good view of the exposed rock of Grantham Mountain with Mt. Ascutney in the distance. Mt. Cardigan has an interesting history. The Dartmouth Outing Club Website tells us, “In 1855, a devastating fire burned over the summit and removed all the vegetation, including the thin soil. 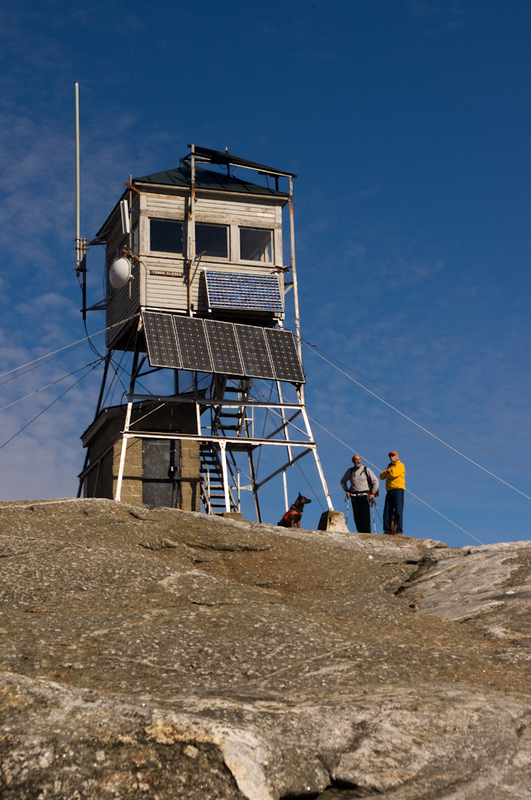 Well over a century later, the summit remains bare of all but a few lichens.” Ironic that there is now a fire watch tower at the summit now. 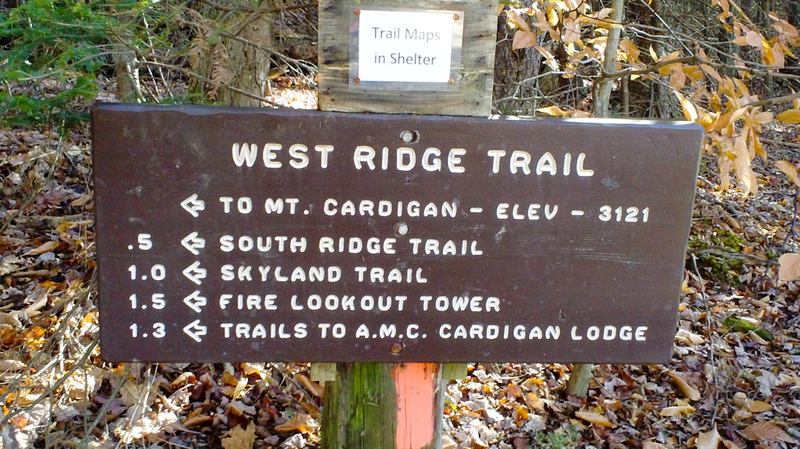 There are few other 3000 foot mountains in the area that are not tree covered at the summit, making Cardigan special. 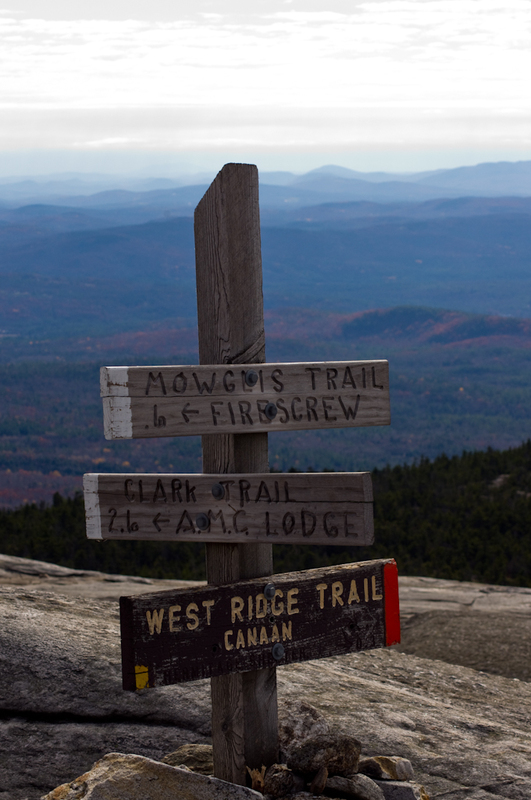 You can get a great view with only a short mile and a half hike up the West Ridge Trail. 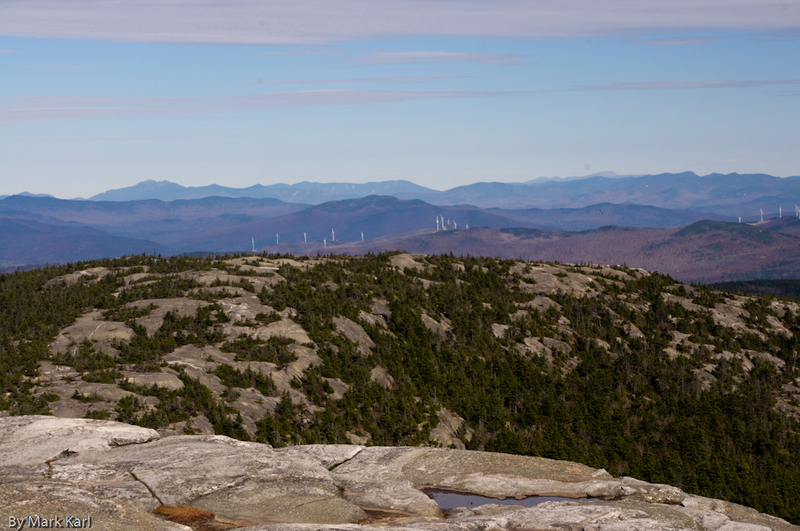 Looking north towards the White Mountains from the top of Mt. Cardigan. I started out with a few wide angle 18mm photographs. This one is looking north towards the White Mountains. 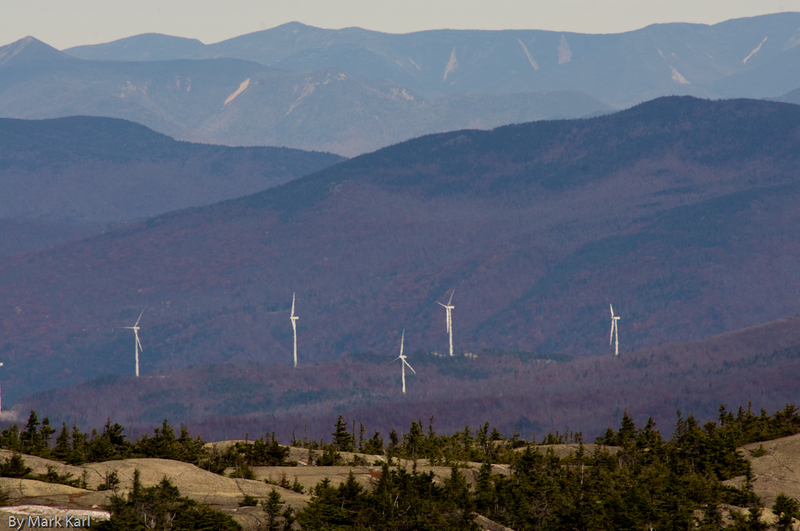 The big surprise to me since my last trip to Cardigan are the Windmills of the Groton Wind Farm. Looking at Mt. Flume, Big Coolidge and Mt. Guyot in the distance to the right. 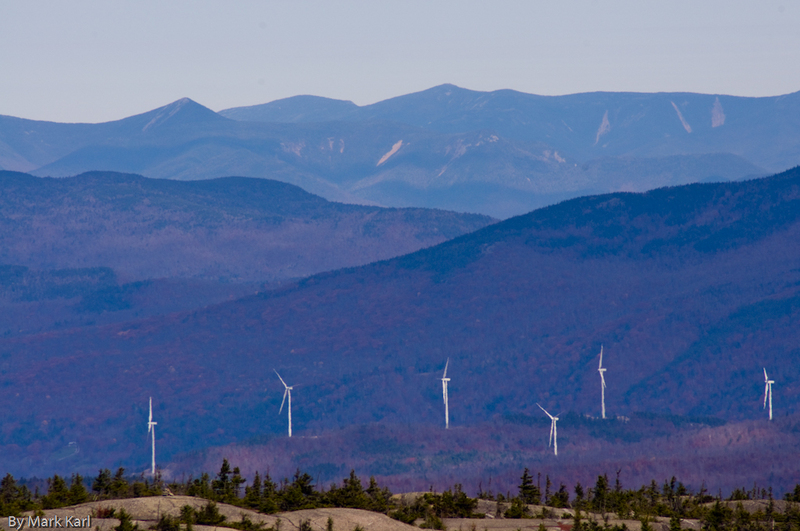 I switched to the 300mm Tamron lens for some close-up shots of the windmills with the White Mountains in the distance. Newfound Lake with Lake Winnipesaukee in the distance from the top of Mt. Cardigan. 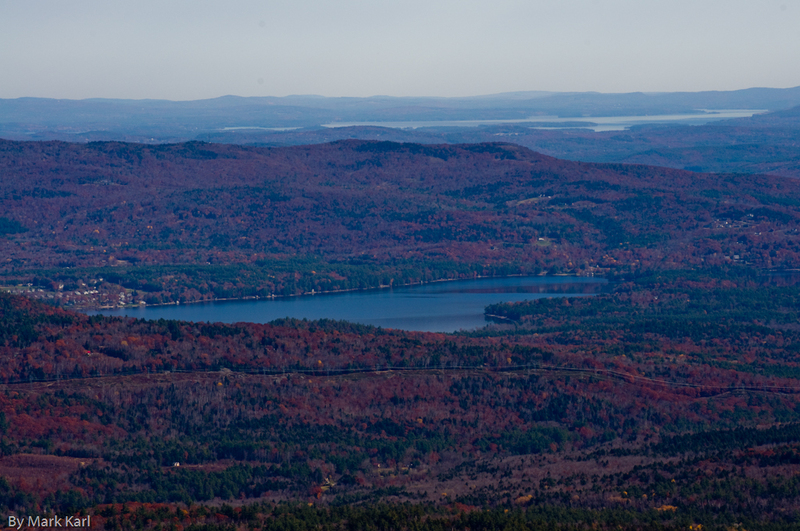 There is also a pretty good partial view of Newfound Lake with Lake Winnipesaukee in the distance. 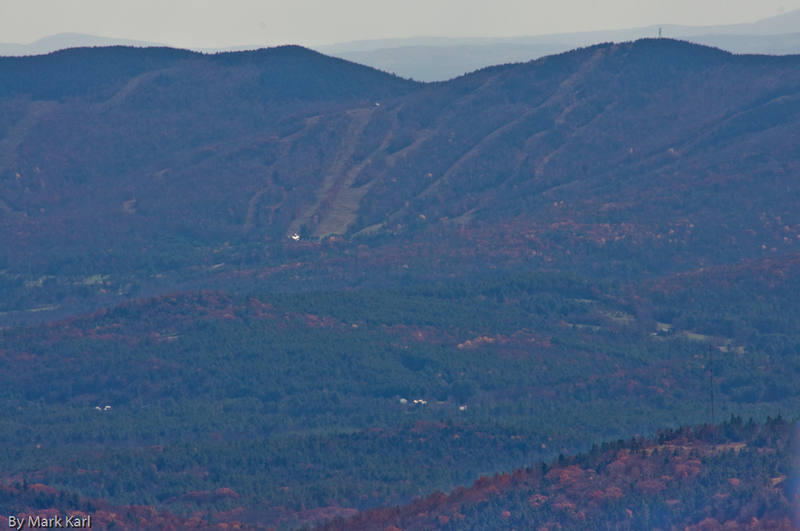 Ragged Mountain Ski Area form the top of Mt. Cardigan. 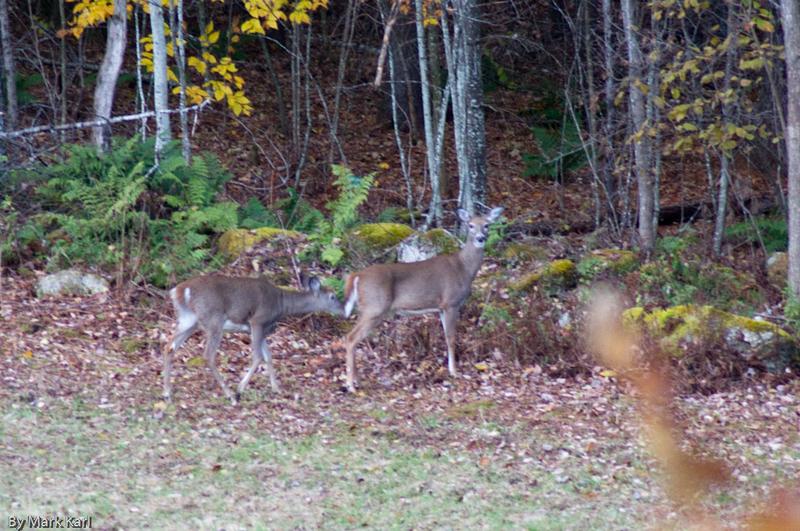 Upon consulting Google Earth I discovered this is Ragged Mountain ski area. I hope to make it over there this coming ski season. Mirror Lake in Canaan, NH from the top of Mt. Cardigan. Next I looked for landmarks a little closer to the mountain. 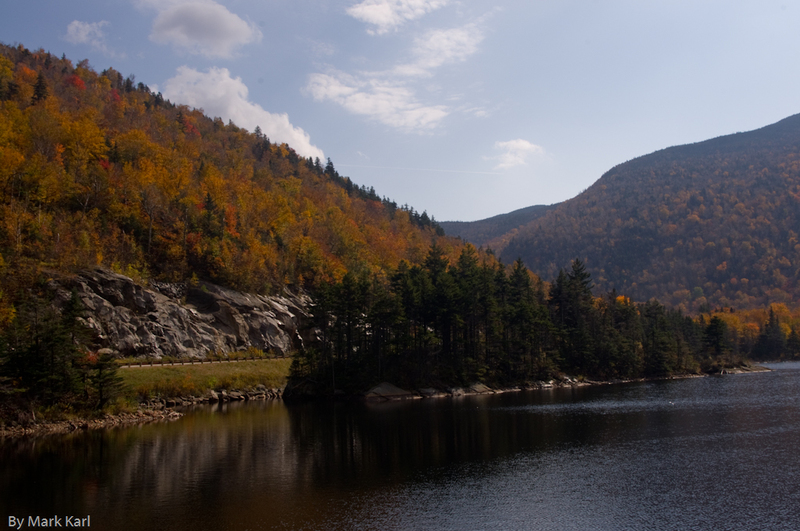 I wanted to photograph Mirror Lake in Canaan since I had stood by the lake several time while taking photographs of Mt. Cardigan. Town of Canaan, NH from the top of Mt. Cardigan. 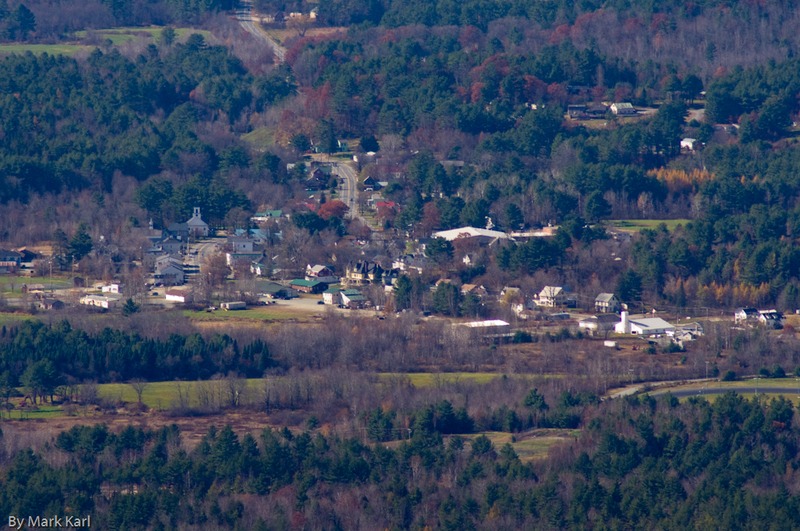 You get a pretty good view of the little town of Canaan, NH from the top of Cardigan. You can just see part of the Canaan speedway in the lower right hand corner of the picture. I would like to return to Mt. Cardigan when there is less haze in the air for some more photographs. I think I will make a point to bring a tripod as well. 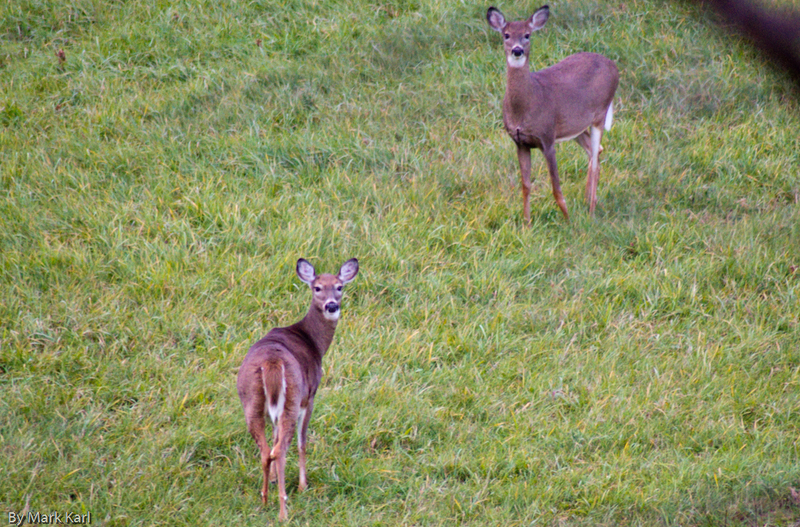 I was on my way home from fishing last week when I spotted a bunch of deer feeding in a field along side Route 10 in Hanover, NH. I pulled into the breakdown lane, parked and grabbed my camera. 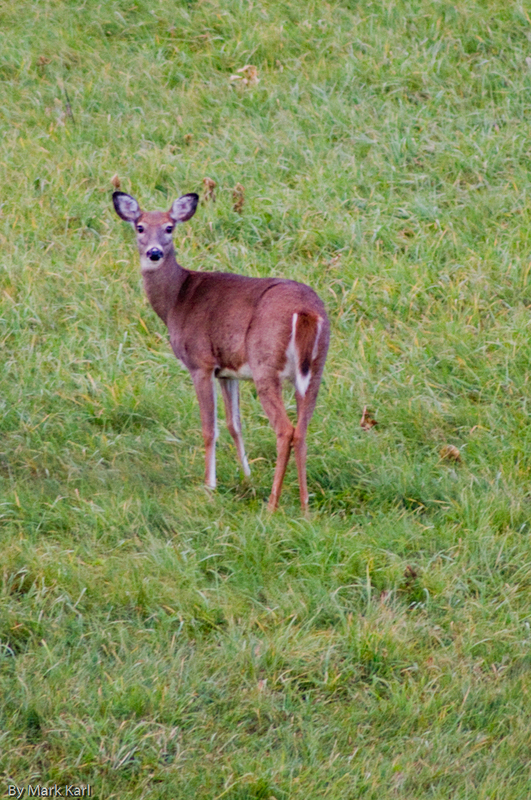 I was thankful to have my Pentax DSLR camera with my 300mm Tamron lens with me. I dashed across the road and tried to find an opening through the trees to snap some photographs. This one still has its reddish brown summer coat and has not yet shed to grow the grayish brown winter coat. 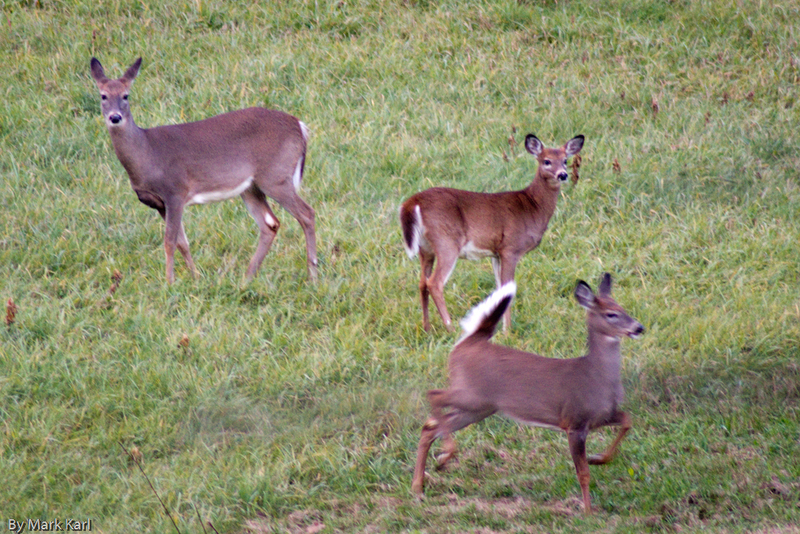 They got a little skittish once they noticed me. 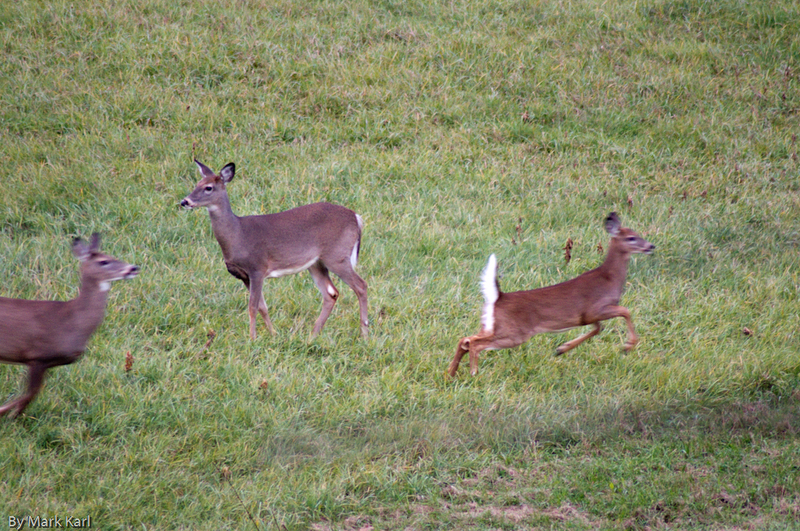 A couple of them have their tails up and are heading for the woods. 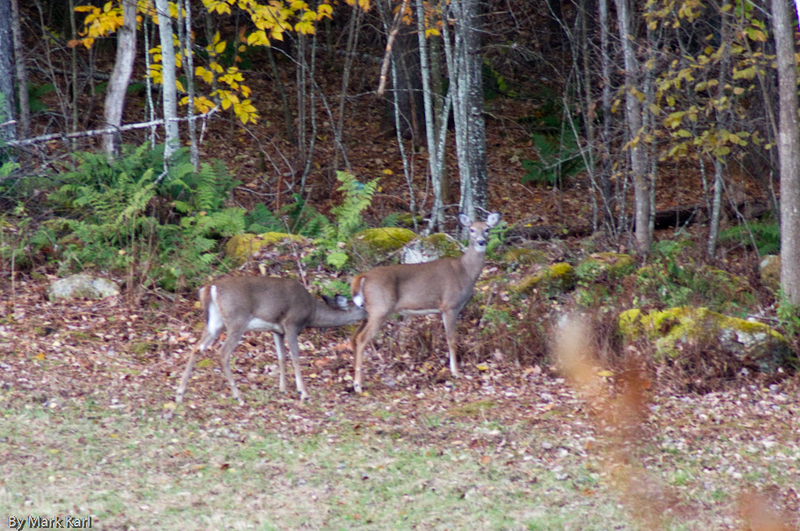 A couple of them paused at the edge of the woods for a while. Wednesday was a nice autumn day for a ride on the Great Northern Rail Trail. I was in Enfield, NH on the section of the trail just before the bridge where the lake is on one side of the trail and a large pond is on the other. 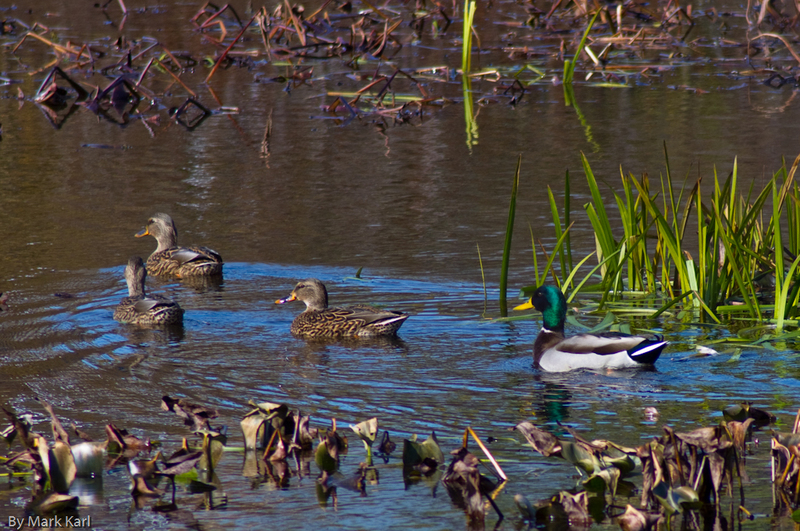 I was checking the pond carefully for wildlife when I spotted several ducks in the reeds on the far side. 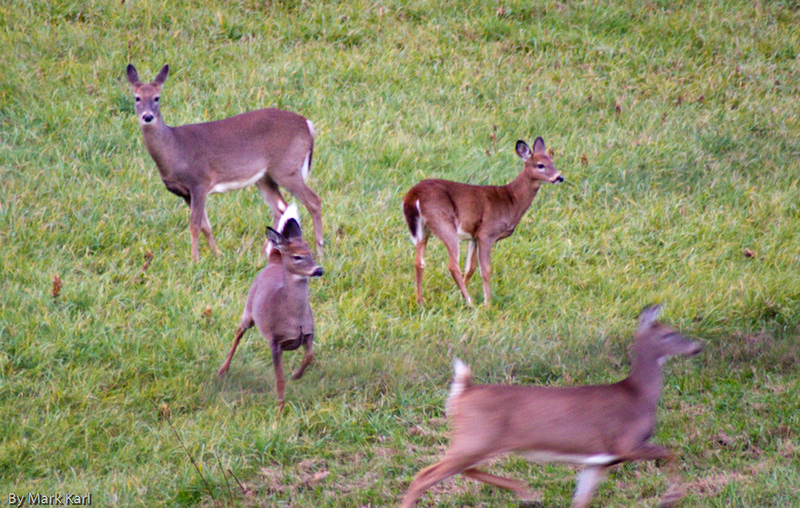 This small flock soon took off so I crept down the trail looking for more. 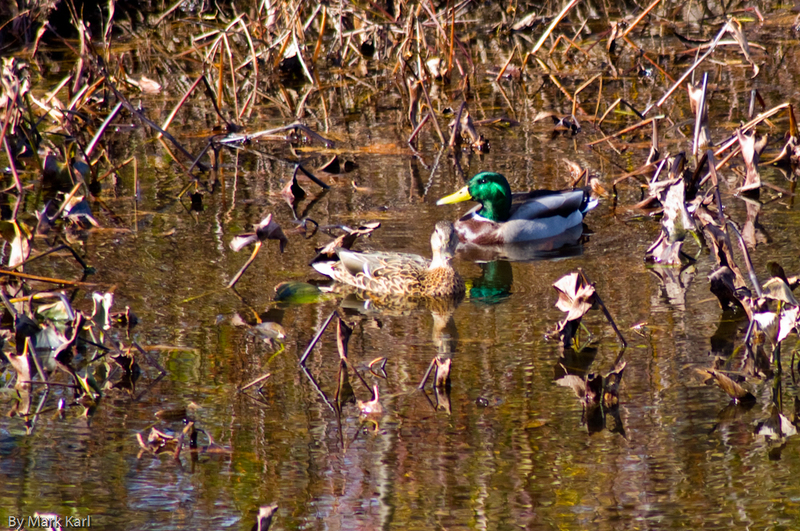 I soon f0und a pair of Mallards but I had to find an opening through the thick brush on a steep bank. 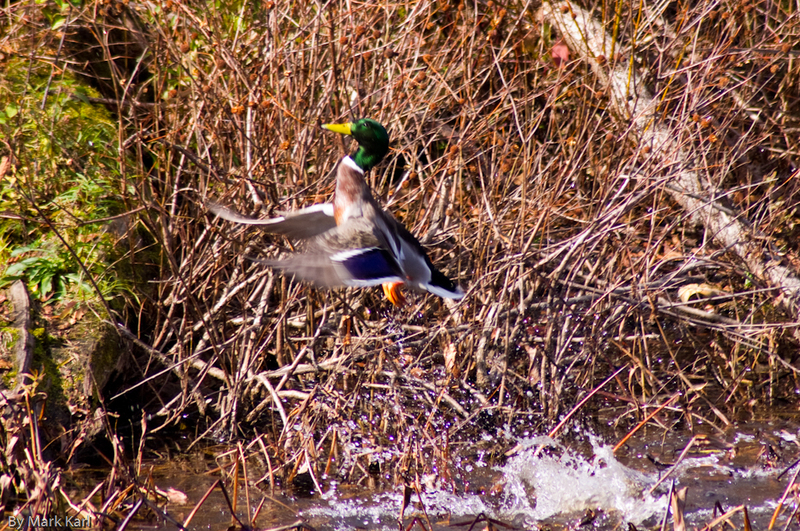 I had moved down the steep bank through the brush in an attempt to get a clear shot at a better angle when the ducks took off. I snapped a quick photo of the male as he launched from the water with a big splash. 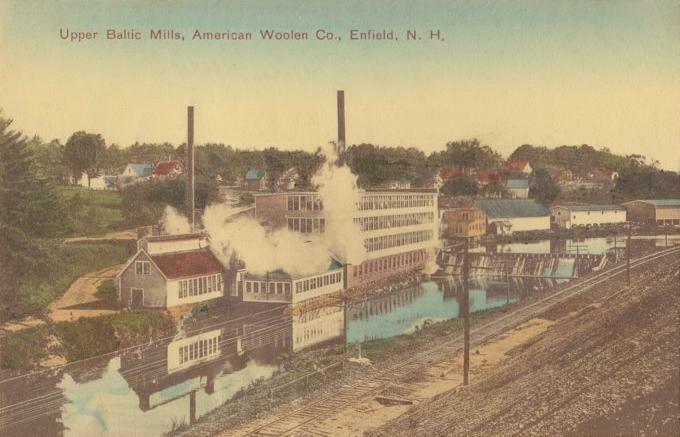 Along the trail in the town of Enfield, NH is the Upper Baltic Mills of the American Woolen Co. I found an old postcard with an image of the mill from 1908 on Wikipedia. Things look a whole lot different now. I did not realize the building was so old. 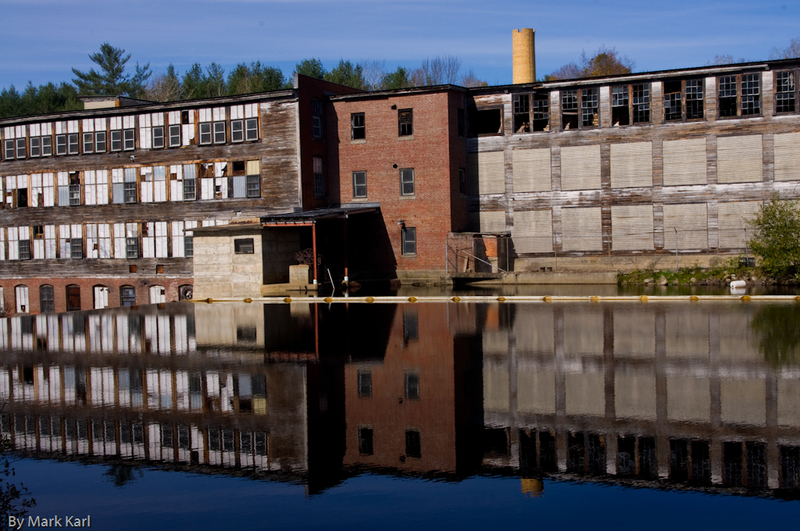 I was able to get some nice reflection photographs of the old mill on the pond side of the mill waterfall. 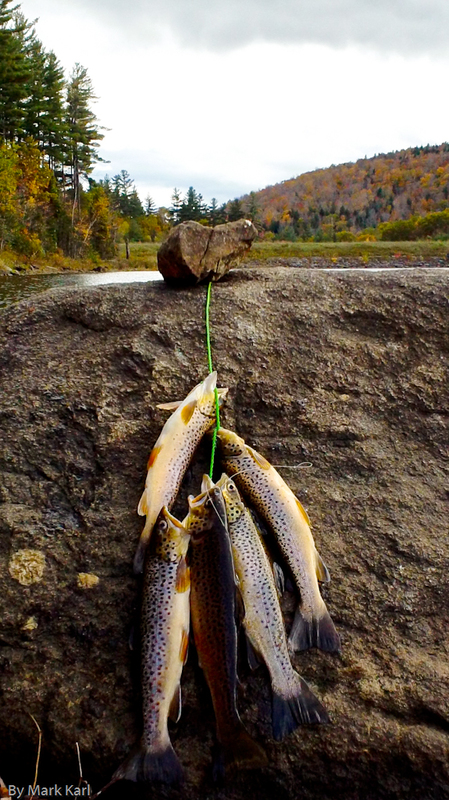 I don’t usually go trout fishing in the Fall but this year I had some free time so I gave it a try. I’m glad I did because the results paid off. I went back to “Johnny’s Rock, which is our new favorite spot since we landed the big trout there back in June. The first trip was on Columbus Day. It was a mostly cloudy day with temperatures hovering around 50. There was also a stiff breeze whipping across the pond at times. Despite the cool temperatures I was extremely happy with the stringer of trout for Columbus Day 2012. 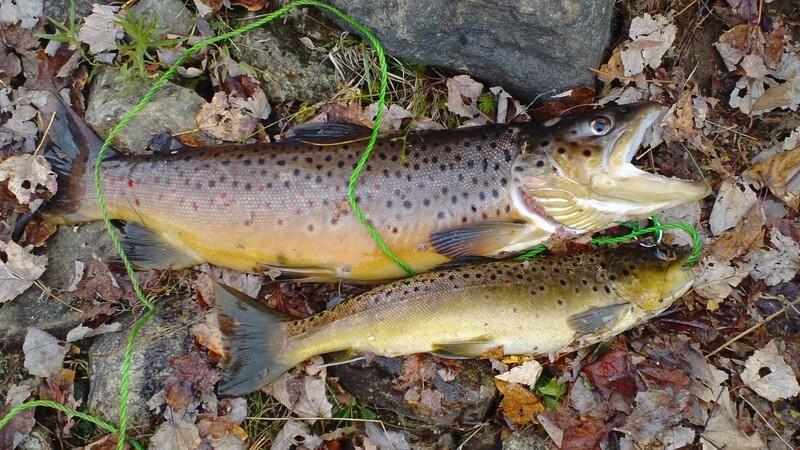 I quickly made plans to return and take full advantage of the remainder of trout season. Tuesday started out with several snags and lost gear. I was there about an hour when something big took the bait. It turned out to be the 19 inch trout in the photograph above. 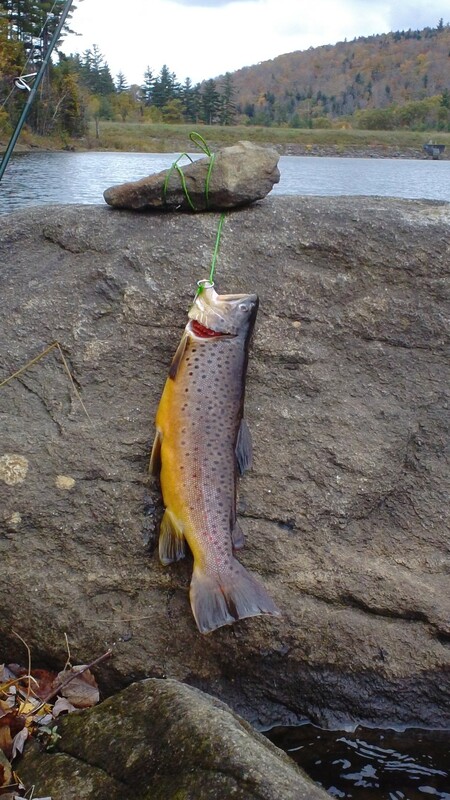 I caught one other 13 inch trout for another day of great fishing in the White Mountains. 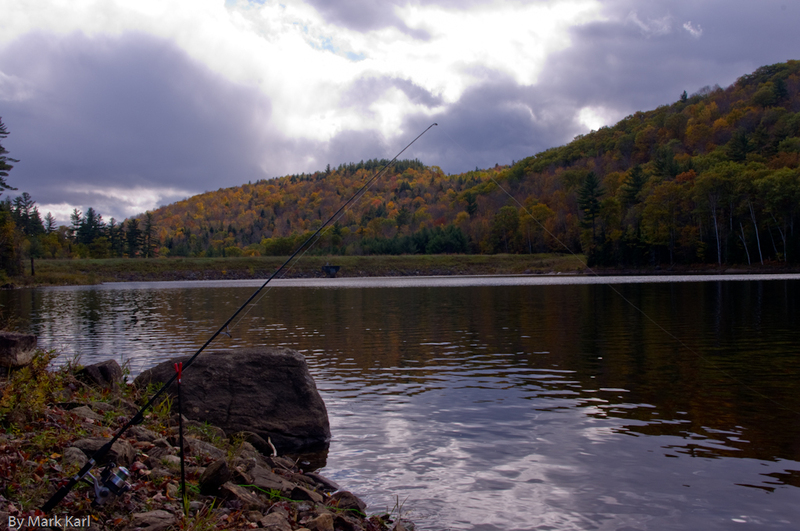 In the future I will make more effort to get out trout fishing in the Fall before the season closes on October 15th. Last Friday we finally got a break in the rain and I was able to take a ride through the White Mountains. I think the colors are just about at peak in the elevations. I drove through Woodsville, NH to the start of Rt. 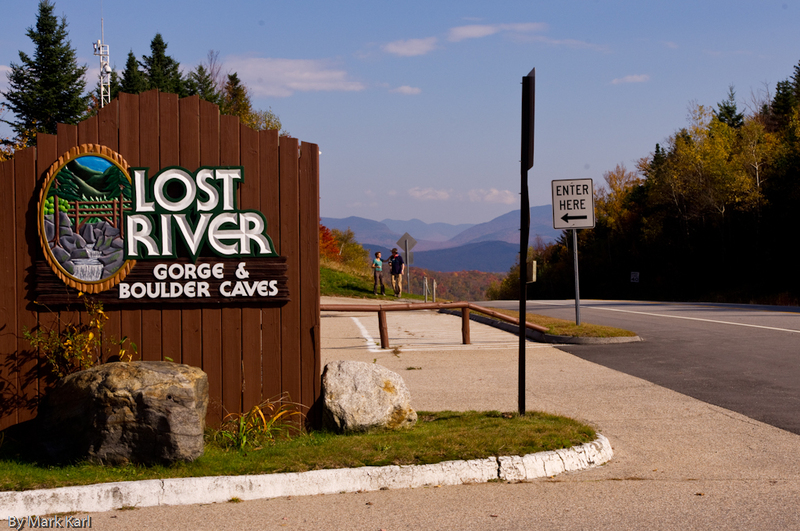 112, otherwise known as the Lost River Road. 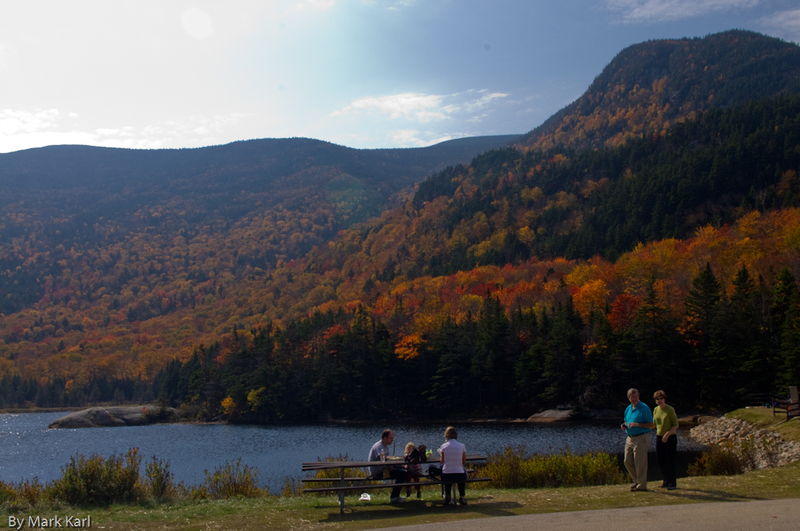 This route goes through Kinsman Notch and past Beaver Pond. A section of the Appalachian Trail known as the Beaver Brook Trail starts near the other end of Beaver Pond. 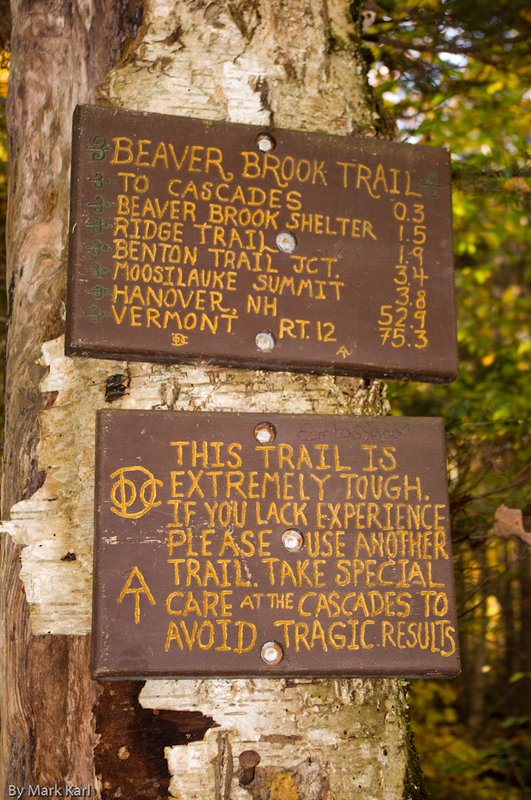 Beaver Brook Trail will take you to the top of Mt. Moosilauke. The first section of the trail is known as the Cascades. 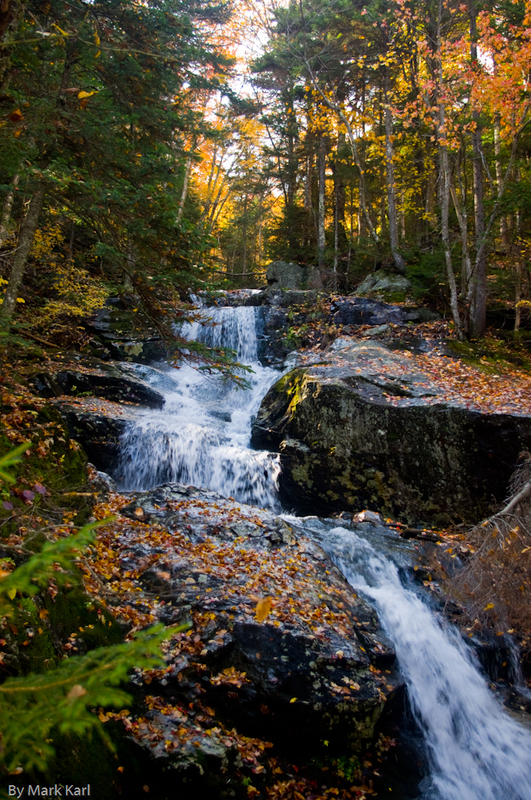 The trail runs alongside a brook with waterfalls that feed Beaver Pond below. As the sign above warns, the trail is very steep and treacherous. 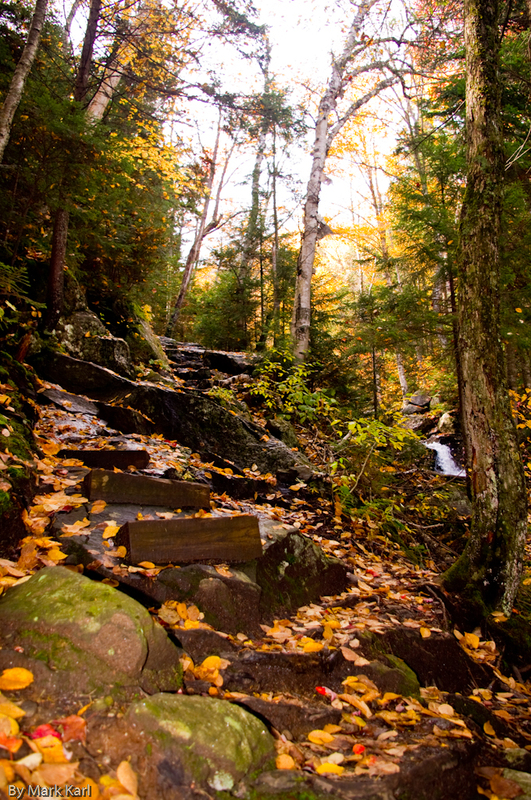 The trail can also get slippery due to dew, fog, rain and water spray from the waterfalls. At places on the trail there are steps and rungs to hang on to with your hands. 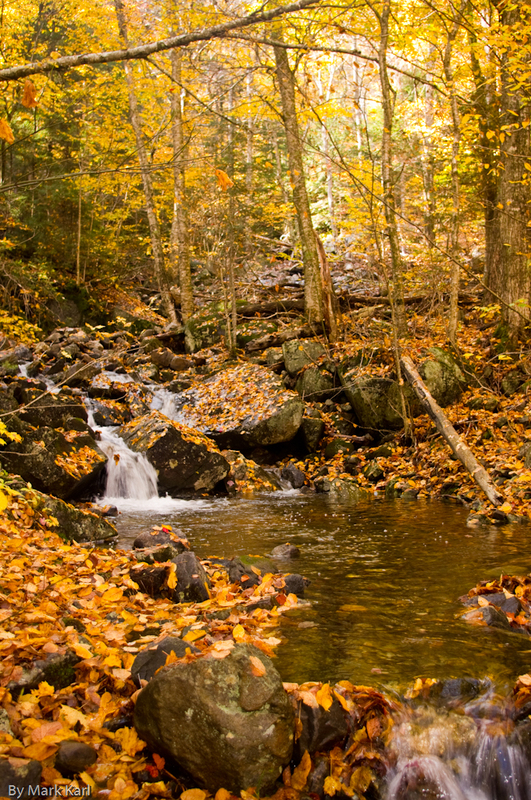 I enjoyed the amber glow of this scene under the fall colors near this small waterfall on Beaver Brook. The photograph above shows some of the steps built into the trail. Further on rungs made of re-bar have been installed in the rock so hikers can have safety hand-holds to climb the trail. This is the first time that I had been up this trail when the foliage had turned color. I’m glad to took the time to come here and plan to come back. 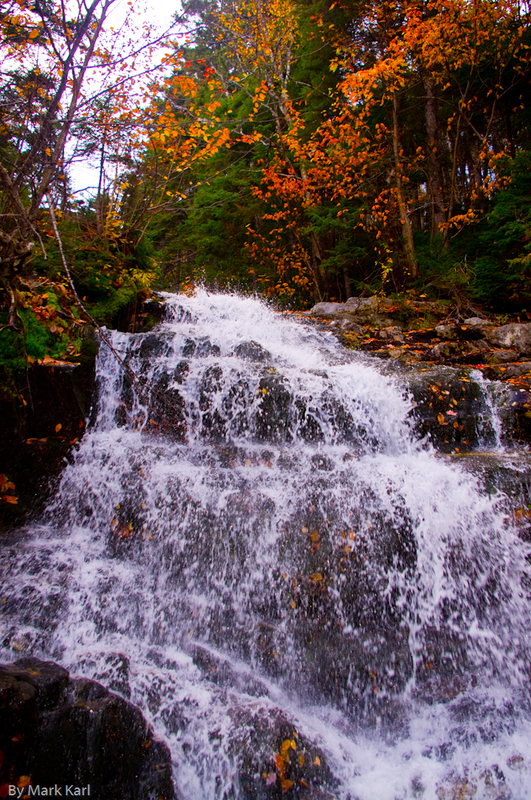 After a quick hike along the Cascades I continued through Kinsman Notch past Lost River Gorge and Boulder Caves. A return trip to explore this place is on the list. 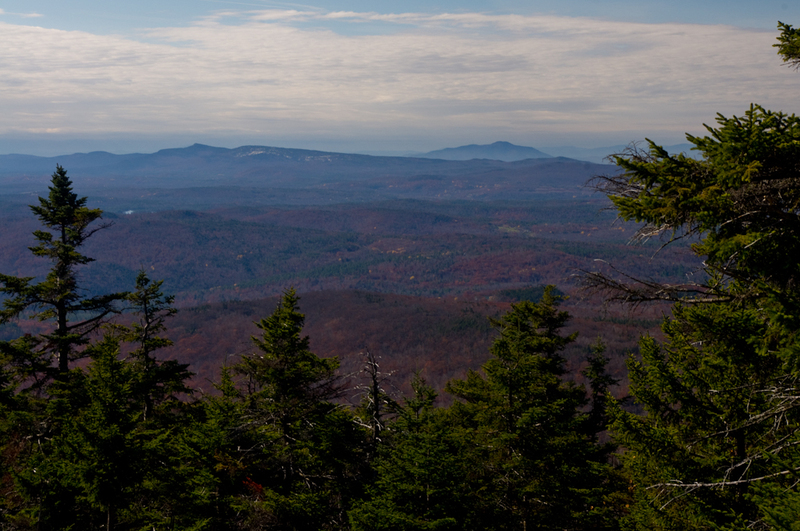 But for today I journeyed on to the look-out on Route 118 for a few photographs of the Franconia Range on my way home. 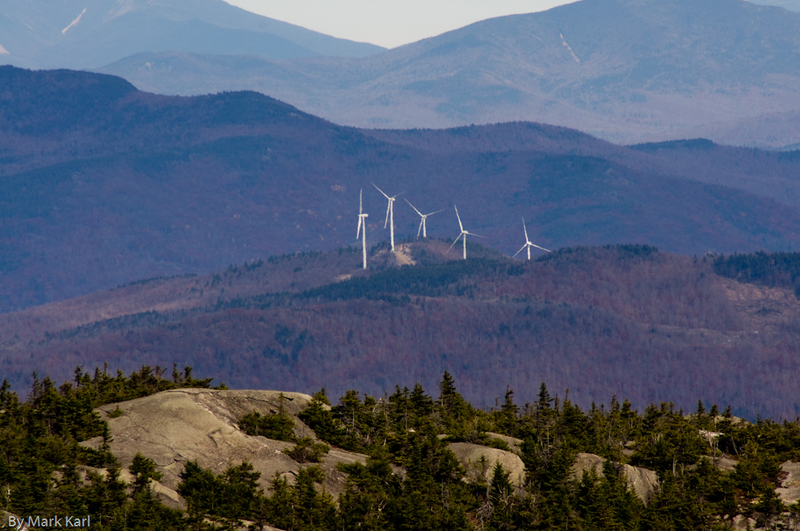 This is one of the best views along Route 118 going from Warren, New Hampshire to Woodstock, New Hampshire. 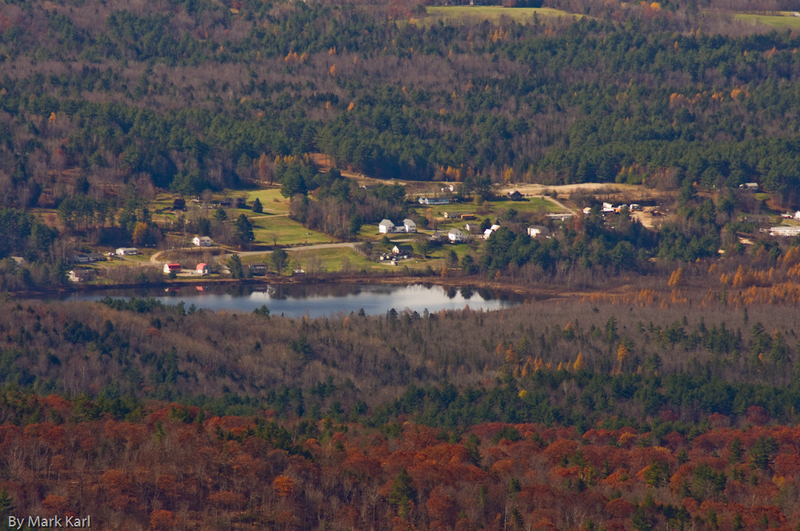 The view is North and East looking down on Woodstock and the southern part of the Franconia Range. Reading Sharpe’s Trafalgar and the historical notes at the end of the book allowed me to learn details of the Battle of Trafalgar that I had not known. Although I had heard about the battle, I only knew the basic facts. I knew that Lord Horatio Nelson had used unorthodox navel tactics to win the battle and that he also died from a musket wound received during the fight. Even though Nelson was not the first to use the tactic, I think he should be given credit for recognizing a good (yet risky) idea and having the nerve to try it himself. English ships would have to endure cannon fire while approaching the French and Spanish without being able to fire back until they sailed through their line. Had the French and Spanish gunners been better, Nelson’s fleet could have been shot to pieces while approaching the French and Spanish ship’s broadside. Cornwell explains that the ship Purcell from the novel was fictional. He tells us, “The Pucelle, when it raked the ship alongside the Victory, was stealing the Temeraire’s thunder.” The Temeraire is the name of the real ship that assisted Lord Nelson’s ship, Victory, during the battle. However, the substitute was a clever way to get Sharpe (and the reader) close to the action near Lord Nelson. 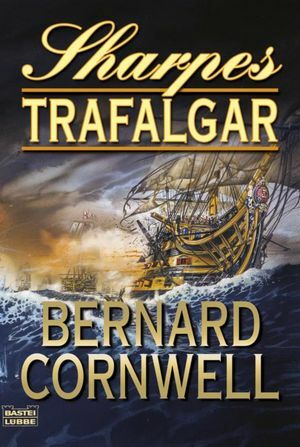 Cornwell did a wonderful job letting the reader experience the Battle of Trafalgar through the eyes of Richard Sharpe. As usual Bernard Cornwell’s historical research is excellent.